Tuscany, and Florence with it, is famously synonymous with some of the most recognizable names in food. Chianti and Montepulciano dominate the world’s wine consciousness, meat-lovers delight in Chianina beef and Cinta Senese pork, foragers beat the bushes for porcini and truffles. But many don’t know that Tuscany is also home to a number of historic chocolate and confectionery artisans, whose wares make wonderful (and easily packable) souvenirs to take home. When in Florence, we always make a stop at Dolceforte (Via della Scala, 21) to stock up on their prettily packaged Tuscan chocolate, candy truffles, cantucci cookies, and other sweet-tooth satisfying treats. High-end designer boutiques line Florence’s elegant thoroughfares between the Duomo and Ponte Vecchio, and visitors can’t help but pause in front of the windows displaying the latest creations from the likes of Gucci, Prada, Cavalli, and other luxury brands. But if your taste (and budget) lean toward the quirky and personal, we recommend a browse through some of Florence’s excellent vintage shops. Our favorite is Gaudeli’s Vintage (Piazza dell'Olio, 4), where the space is overflowing with everything from the classic to the off-beat in clothing, shoes, jewelry, and accessories (including some fabulous sunglasses to channel your inner Golden Age Film Star), all guaranteed to be one-of-a-kind and a fashionable memento of this chic city. Florence is undeniably one of the most photogenic cities in Italy, from its intricately inlaid polychrome Duomo to its buzzing, animated markets to its quiet, colorful neighborhoods. But we can pretty much guarantee that whatever photo you may snap, at least 400 other visitors have the exact same shot on their memory cards...with (shhh!) a couple of exceptions. One perspective of the city that very few visitors are able to enjoy is from the middle of the placid Arno River as it runs under Ponte Vecchio and past the pastel-hued palazzi facades which line the banks. 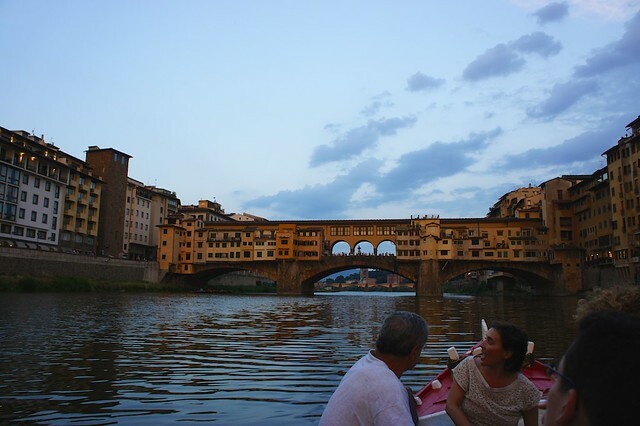 Florence’s rowing association, I Renaioli, offer boat trips down the Arno, and we love to organize private sunset trips for our travelers, who are able to capture the golden-tinged city from the unique vantage point of its flowing heart. For a bird’s eye view, we suggest hiking up the steps of the Torre San Niccolo, restored and reopened in 2011, which dates from the early 1300s and was once part of the Medieval defensive walls encircling the city. From each of the tower’s three stories, visitors are treated to views over the tiled Florentine rooftops and sparkling waters of the Arno. 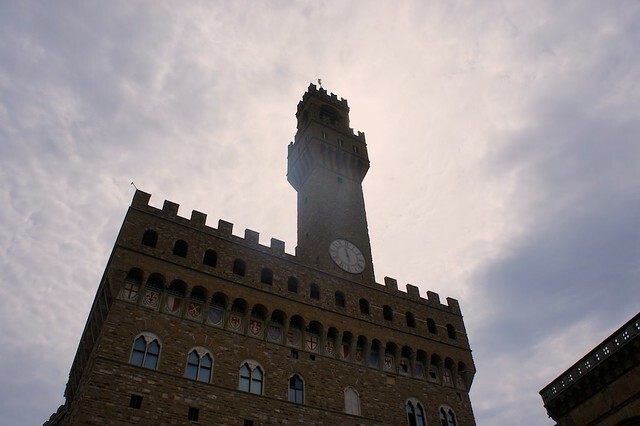 For the more ambitious, one of the highest points in Florence is the 95 meter tall tower of Palazzo Vecchio, which celebrates its 700th anniversary this year and reopened to the public last year. From here, photographers can snap not only the center of Florence, but the surrounding rolling Tuscan hills. Tweetable: If you’d like a different photographic perspective of Florence, here are our two favorite photo-ops. Yes, of course any visit to Tuscany should be peppered with unforgettable meals built around such classic dishes as ribollita, tagliatelle al ragu di cinghiale, and bistecca alla Fiorentina. But sometimes we crave off-beat Tuscan, and that’s when we book into Lungarno 23 (Lungarno Torrigiani 23). This casual spot, painted a warm ochre and lined with shelves of Tuscan wine inside or, on the outside patio, featuring a view over the Arno and Florence on the opposite bank, specializes in classic Tuscan ingredients, but updated and served with a friendly, contemporary flair. Try their hamburgers, hot dogs (yes, hot dogs), and sushi—all made with DOC Chianina beef—and pair it with their organic french fries or a side dish of local fava beans or grilled vegetables. A family-friendly restaurant (both for their kid-pleasing menu and their stock of crayons and books), a meal here is a welcome break for everyone. More and more travelers navigating Florence’s countless restaurants have dietary preferences or health issues, making options including vegetarian, vegan, and gluten-free a priority. At Vivanda organic enoteca, (Via Santa Monaca, 7), the owners’ own organic wine is featured, as are artisan beers and a surprisingly varied menu of antipasti, soups and pastas, cheese and charcuterie plates, and desserts featuring locally-sourced ingredients and seasonal produce from nearby Tuscan farms, all of it organic. There are a number of vegetarian, vegan, and gluten-free dishes offered, marked on the menu and served on recyclable and compostable tableware. 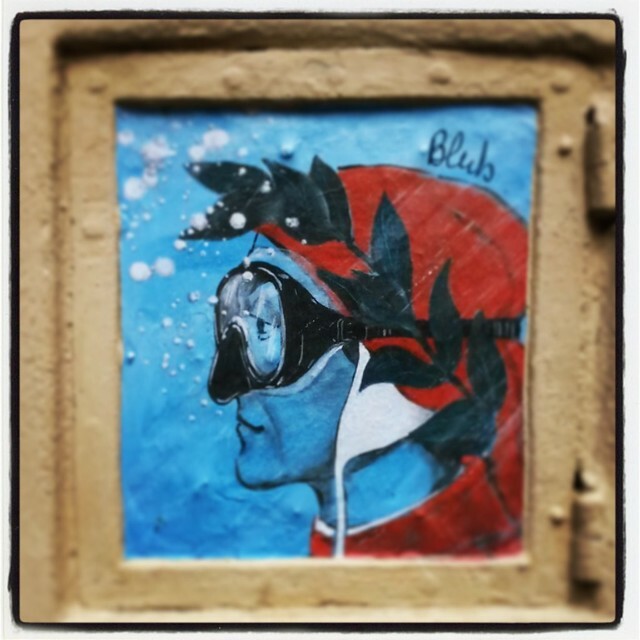 Tweetable: Whether it’s food or art, Florence has a bit of edginess to be discovered. Sure, art and Florence. Like a horse and carriage, there is nothing new about that. Or, is there? 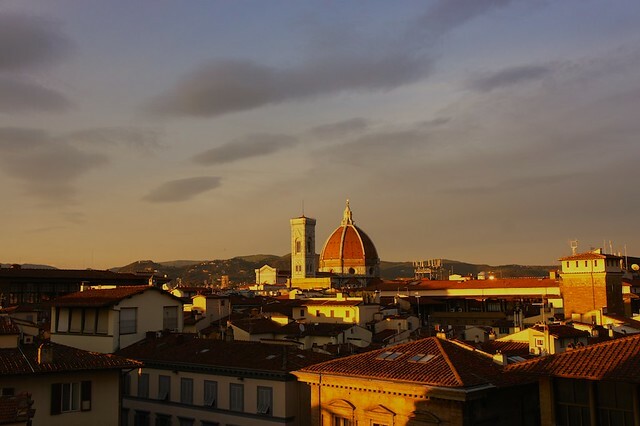 No need to poke your nose into Florence’s many hidden art treasures (though, of course, we love to arrange private visits at any of these sites for our travelers) when all you have to do is pay attention while wandering Florence’s streets and piazze. We especially love French-by-birth-but-Florentine-by-adoption Clet Abraham’s tongue-in-cheek street signs. By adding minimalist stickers to standard traffic signs, he is able to transform them into chuckle-inducing (and sometimes biting) visual puns. Take a look here for some examples to look out for, or visit his studio at Via dell'Olmo, 8R. 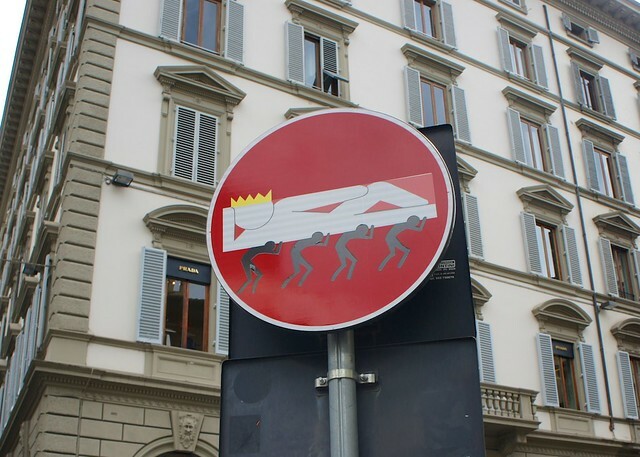 Equally cheeky are the works of the mysterious Florentine graffiti artist who signs his pieces “Blub--L'arte sa nuotare”. Specializing in depictions of famous personages (Leonardo da Vinci, Picasso, and Christ, for example) or works of art (Botticelli’s Venus and Michelangelo’s David have been spotted) sporting snorkling goggles, the enigmatic Blub stated recently to an Italian reporter that his masked figures represent Italy, awash in an economic and cultural crisis but also with both the means and adaptablility to navigate out of its “deep water”. Whether or not the message is clear, the images are sure to make passersby smile.